The biomedical system, the predominant approach to illness in the West, has done an excellent job of making people believe that the most effective (and often the only) way to treat mental illness is with medications. But you don’t often hear about the horrific side effects of these medications, sometimes worse than the symptoms they are intended to treat, and the fact that drug prescribing is still essentially a guessing game. You don’t hear about the conflict of interest in having psychotropic drug research funded by pharmaceutical companies with a huge financial incentive to generate certain findings. The biomedical model, with its focus on biological causes, also tends to cut off dialogue on other conditions that can affect mental health. A number of ex-patients whom I interviewed found that medications were beneficial to them at some points in their life, but felt that there should be awareness that it may obscure the deeper, social dimensions of the problem. That is an extract from an essay by mental health professional and Buddhist practicioner Maia Duerr, and it appears in Not Turning Away: The Practice of Engaged Buddhism, an anthology of articles from the Journal of the Buddhist Peace Fellowship. That fellowship is informed by the teachings of the Vietnamese Zen master and author Thich Nhat Hanh, and in a recent comment I remarked on the remarkable coincidence that the previous owner of a book by the Zen master bought secondhand by me was a complete stranger who shared my not very common surname. Now, in a supreme example of interconnectedness, that previous owner has not only read my post, but has also added a comment of his own that bravely recounts how Thich Nhat Hanh’s book Being Peace helped him through a period of “serious depression resulting from work related stress”. As someone who in the past has been there and done that – both work related stress and the deeply unpleasant side-effects of medications – his comment resonates with me and endorse my advocacy of non-chemical treatment of such conditions. Classical music has much unrealised potential in this field and I have already written of how A symphony a day keeps the doctor away. To my list of medically beneficial music in that post should be added the curiously overlooked symphonies of Alexander Glazunov. These are a bridge between the winter daydreams of early Tchaikovsky - who died when Galzunov was 28 - and the winter nightmares of Shostakovich - who Glazunov taught. But, thankfully, Glazunov’s eight completed symphonies – there is a fragment of a ninth – are more daydream than nightmare. If you don’t know these life-affirming works the set seen above of the complete symphonies together with his, again curiously overlooked, concertos is highly recommended. 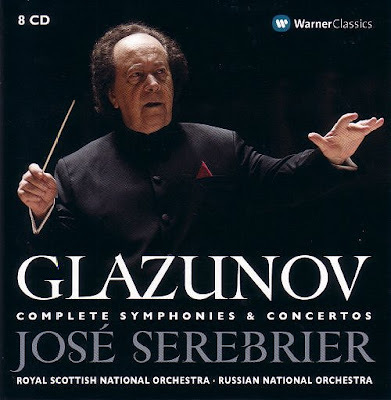 The symphonies are passionately played by the authentically Russian sounding Royal Scottish National Orchestra under the – sorry to keep repeating myself, but curiously overlooked - José Serebrier, while the Russian National Orchestra accompany the - yes, overlooked - concertos under the same conductor. And the current UK retail price for the eight CD Warner set of around £36 means the financial side-effects of engaged classical music are not too horrific. I wrote in an earlier comment about music therapy, and I'll not repeat myself here. A different thought that comes to mind concerns the work of Manfred Clynes. A distinguished concert pianist in his day, a largely self-taught neurophysiologist, he holds some forty patents on inventions, including the CAT computer. His entry in Wikipedia is fascinating reading, to say the least. But he also developed the system of what he termed 'Sentics', a coming together of music and neurophysiology. That too may be read about on the internet, but what makes me curious is that, although Sentics is a most useful tool in the area of mental health, notably depression, I've never come across evidence that it is being used for that purpose. Or any other for that matter. I've owned Clynes book on Sentics for many years and the seeming neglect of the system baffles me. I'd be very interested to know if any other readers here are even aware of the it. Although I only know 4, 5 and 6 and the violin concerto, would it not be fair to say that the reason his music has languished in the shadows is not because of ever-present sentimentality, but more the almost complete absence of even a spark of genius - the sort of genius that you can detect in, say, Harris 3, and hardly at all in the rest of his output? Mahlerman, of course Glazunov is not another Beethoven, and nobody is claiming he is. But what is genius? And if indeed it does exist does that mean we can only appreciate and be moved by music written by designated geniuses? Should we ignore Hanson, Korngold, Rubbra, Arnold, Magnard et al because they are not generally recognised to be geniuses? I'm not too interested in whether Glazunov was a genius. I appreciate and have been moved by his music - and that is what matters for me. This preoccupation with genius is a dualistic barrier to some very deserving composers receiving the recognition they deserve. Bring on the non-geniuses! So, that would be a no then? Not a no, and not a yes. I don't know what the definition of a genius is. Therefore I cannot say if Glazunov is one or not. As above, I appreciate and have been moved by his music - and that is what matters for me. I've been very moved by his music, and studying Glazunov's scores has given me an acquaintance with the material that allows me to say without hesitation that he was a genius. Other's mileage with him may differ. I don't think Glazunov was a genius, but nor do I care -- he furnished the rooms of our minds with some marvellous music. Genius itself does not much puzzle me, and I am inclined to see it as akin to compulsion. It is in looking at the unquestionably great composers that we may boggle variously at their vast output, early deaths, circumstances in which they worked. Sometimes it defies comprehension, as in Constanze Mozart's journal entry describing Mozart composing the Magic Flute through the night, drinking wine the while, and asking Constanze to read to him as he worked because he was getting bored! There is the essence of musical genius -- music as a genetic component. Such as he, Bach, Beethoven, Schubert had teachers, but none were taught to compose -- the genius for that was congenital. Lesser composers surely were taught the art, and had they not been may never have composed at all. Some of their music may be wonderful, but they are not among the geniuses. The genius that interests me in not that of the composer of towering means and reputation, but that of the listener who hears the flash of the ineffable wherever it might occur. That is why I read this blog. I cannot conceive of what a "flash of the ineffable" in the context of work of music might be. All classical music is per se ineffable. Music with a "flash of the ineffable" would presumably in its other parts be expressible in words. What it may rather contain is flashes of what Conrad called the "magical suggestiveness" of music, and perhaps in that we come closest to discerning meaning, though Stravinsky, Beecham, Nietzsche, et al., thought it has no meaning at all. I think it does, but ineffable meaning, and most akin to silence. Forgive the inexact metaphor in my earlier response. Conrad's "magical suggestiveness" works fine for me. My choice of words comes from the philosopher Vladimir Jankélévitch's "Music and the Ineffable", in which he writes of the elusiveness and bewitching power of Charm (the ineffable) in music. My real purpose was to express appreciation for the blog author's expert guidance in finding very worthwhile music by "non-genius" composers such as Magnard (who I just now found mentioned in my copy of Jankélévitch). Responding to Philip Amos -Like you, I have had a copy of Sentics for years, and like you, have been baffled as to why it, and Clynes musical work in general (he sure hung around with some heavy hitters), has not gained more acceptance. I've always felt part of the reason music moves us is that it encodes physical gestures (which can have emotional content). If you don't know about "mirror neurons" - you might find them interesting. When we see someone making a gesture, part of our brain reacts as if we were making it ourselves. My feeling is that for music of any kind to reach someone, it's gestural content needs to be something the audience can recognize and want to connect with. Responding to Pliable's more general point - One thing to consider about the positive effects music can have is - if that's true, negative effects are also possible. Various people are going to find wildly disparate pieces of music life affirming - and it's totally a different strokes for different folks proposition. What's positive for some will be negative for others - and from a Buddhist perspective, with no permanently fixed identity - something that's works for us at one point in our lives may well not work at others, and visa versa. Jerome, I understood your main point very well and couldn't agree more. Of late, Bob has had me making notes almost daily and sending me off to the Naxos Music Library in search of composers new to me -- two recent ones have been glorious discoveries. Surely many of us are grateful for that. And I'm grateful to you for the mention of VJ's writings, which I shall seek out. Lyle, I'm delighted to find your comment here -- you went through my mind as I was writing my first comment. I must read about 'mirror neurons'. Before a physical disaster put an end to it when I was 15, I was set for a career as a conductor and I did conduct under the tutelage of Emil Spira, Webern's last private pupil. I think that explains why to this day it is impossible for me to keep my arms still when listening to certain works. Indeed, just recently listening to Barbirolli's glorious recording of the Sibelius 2nd, halfway thought the last movement I had a compulsion to stand and conduct purely to see if I had so absorbed JB's conception that my gestures would at this point mirror his, not visually, of course, but in that my gestures were absolutely at one with the music, if that makes any sense. And they were. I rather shocked myself. And so, Lyle, I agree with you totally re gestural content, which must bring to mind music and movement therapy for, in particular, children with conditions such as autism, cerebral palsy, Down's, Asperger's, etc., something I've done a little to promote here. Your last point cannot be overemphasized. And one use of Sentics is that it can be used to determine what music appeals to the subject, which in turns means what music is best used in Sentic therapy, or any other. My thanks. Philip - Your point about moving to music reminds me of a point Greg Sandow has made a number of times. There's one orchestra, I think the Berlin Phil., that lets the players actually move like human being while they are playing. Besides that letting them be more expressive in their playing - that's got to be firing mirror neurons in the audience, giving them a much stronger connection to the music. He was indeed writing of the BPO, Lyle. He also mentioned the example of a Marching Band, of the student orchestra at the U of Maryland School of Music moving to choreography created for them as they played Debussy, and Thomas Quasthoff swaying as he sings. I might add Carlos Kleiber waltzing as he conducted Johann Strauss. And all of this perfectly natural. I'm NOT adding Lang Lang or Bernstein to the list! I find much of what is in this posting to be of great interest. I still remember with fondness the enforced immobility I suffered several years ago because I was able to pursue and album of the late Beethoven string quartets. The music did much and had much to offer that abetted my recovery. Still and all, and I am a long time lover of All Things Classical when Music is involved, I am not certain but that any choice of music could offer much in the way of recuperative power. Sandra Trehub points out some of the features that outline the universal nature of music. Pitch levels that vary in a regular fashion, melodic contours that are interesting but not too much so (small integer relationships)tempo and timing are some of the topics discussed in the article. The point is that any kind of music will be found to bind the listener socially to the rest of human kind and that is where the healing aspects lie, not in the particularity of the local music listened to-pop or classical may be a curative for what ails the patient. Raymonde, re your last paragraph, there are many scientific studies and much literature that may convince you otherwise. May I recommend Oliver Sack's collection of articles and essays, Musicophilia, many of which relate to the effect of music on the brain and on bodily dysfunction. And also the late Don Campbell's and Alex Doman's 2011 book Healing at the Speed of Sound, particularly Part Five, which offers a very good account and summation of the findings of scientific studies. Fascinating stuff indeed.